ADDITION of a vertical flank to America’s armies has hastened victory. Napoleon could not cross the English channel, but General Eisenhower couldâ€”with the help of airborne divisions. In the Orient, too, these “sons o’ guns with tons o’ guns” have literally leaped forward. Flying infantrymen are one of this war’s most spectacular and significant developments, and may be a means of preventing a third world war. The Nazis staged the first airborne assaults, but their invention has boomeranged. The Berlin gangsters had been impressed by the mass parachuting of Russian soldiers; the Germans already had developed gliders because they were forbidden to build warplanes. By parachutes and gliders, Hitler dumped 35,000 menâ€”an army as big as George Washington’sâ€”into Crete and took that Mediterranean isle. The Nazis made many costly mistakes. But American and British officers saw that those errors could be avoided, and that nearly everything that fights could be flown. Quickly, Uncle Sam and John Bull then developed superior airborne forces. A vast array of new, light, and compact materiel was invented. New ways of stowing, landing, and assembling standard equipment were devised. And the techniques of both parachuting men and supplies to earth and landing military forces in gliders were improved. There are now about twice as many glider-borne men as paratroopers in an American airborne division. There are artillerymen, engineers, doctors, and numerous other specialists among these men. An airborne division now lands with literally everything from flame throwers to chaplains. It is really a miniature army that can be swiftly enlarged, as soon as an airhead is won, by landing transport planes full of additional fighting men. Simultaneously with the creation of such divisions, new theories as to their use were evolved. The Germans had thought only of hit-and-grab raiding. 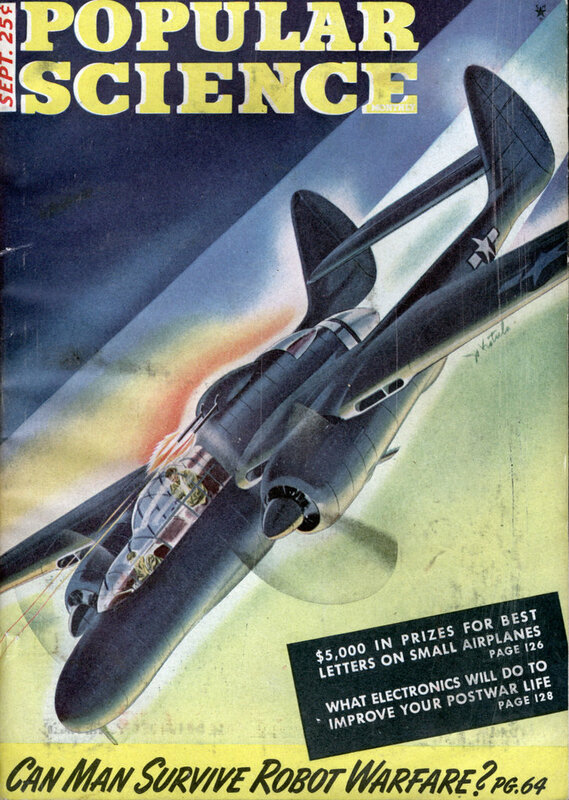 American officers perceived the greater potentialities of teamwork between airborne and other forces, and have made airborne missions a razzle-dazzling feature of land and naval drives. Generals could not learn to use airborne troops as they learn to employ other forces, by studying the campaigns of Napoleon, Grant, and other military geniuses. But in Africa, Sicily, Italy, New Guinea, Burma, and France, American officers have become increasingly proficient in vertical envelopment of their foes, as the record amply proves. 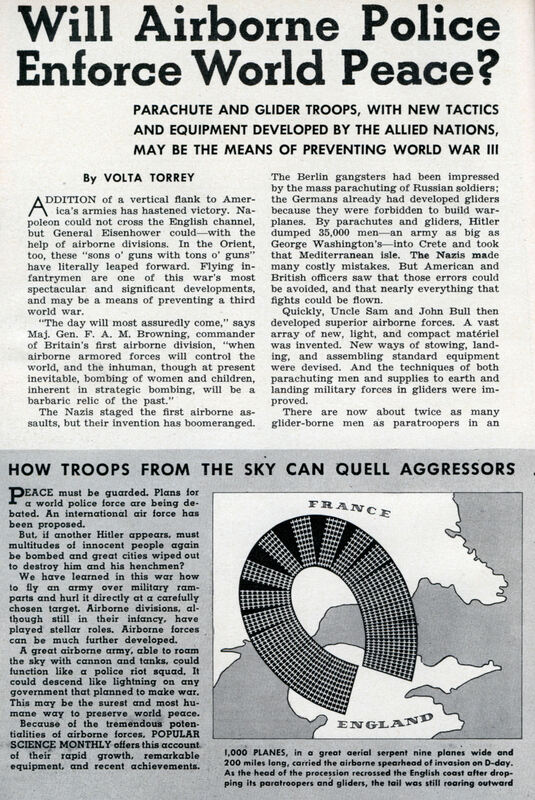 An airborne division is still a “weapon of opportunity.” It cannot be used with maximum efficiency until a high degree of air superiority has been attained, the weather is okay, co-ordination with other forces has been arranged, and important objectives have been chosen that can be taken quickly by lightly armed men. Hurling an airborne division directly at a mighty and mobile ground force now would be like sending high-school boys out to play football against a heavy, professional team on its home field. An airborne division cannot yet be reasonably expected to sustain itself in enemy territory for more than five days unless they receive some help. But chances to use these forces arise constantly. They can cut communication and supply lines, delay the arrival of the enemy’s reserves, create diversions and confusion in his rear, reinforce imperiled units of their own men, and seize and hold strategically important but lightly defended areas. Even when idle, an airborne division is useful. For its mere presence in a combat theater forces the foe to guard many points in his rear that he might otherwise neglect. Suppose, for a minute, that you could see an airborne division land. In less time than it takes a crew of circus roustabouts to fill a vacant lot with tents and animals, a field would be filled with warriors and weapons. Brightly colored parachutes, popping out of low-flying planes like flags from a magician’s hat, would briefly cover acres of sky. Fleets of boxcars beneath wings without motors would coast over tree-tops and land in rows like parked automobiles. Out of parachuted bundles, and out of the noses of gliders, would come cannon and ammunition wagons, jeeps, motorcycles, trucks, and nearly all the other paraphernalia of a modern mechanized army. So much would happen so fast that you could see only a small fraction of this activity. A 75-mm. howitzer might be parachuted down, assembled, loaded, and fired in 6V2 minutes. Almost simultaneously, the airborne engineers might be blowing up a bridge, laying a mine field, and pumping water through a purifier into a canvas tank. Meanwhile, the ordnance men might have set up a machine shop to repair damaged materiel, and the surgeons would have their portable hospital ready for operations on wounded men. The exact portion of the enemy’s rear to be jabbed and taken over by such a division might have been marked by pathfinders a few hours before the arrival of the main force. The pathfinders are small, select groups of paratroops who leap from high altitudes and delay opening their ‘chutes until close to the ground to avoid detection. These men carry flares, smoke pots, and other equipment to enable the troop-carrier planes, coming in low in the dark of night with the main body of paratroops, to find the precise point designated in their orders as the DZ (drop zone). Since a small unit surrounded by the enemy might be quickly destroyed, landings may be made simultaneously at several points and by both parachute and glider regiments. A 15-passenger glider can be landed silently in less space than you need to play football; even bigger gliders can slip into jungle clearings too small and rough for airplanes. And the minute an airborne division touches the ground, its men begin to function just like other highly trained and well-equipped infantrymen. “A four-star general dignifies himself when he salutes them,” The New York Times has said of our paratroops. They are this war’s lightweight champs. They look like the tough little guys who sometimes play quarterback on big-time football teams. Never more than six feet tall, or weighing more than 184 pounds, these men are volunteers, between 18 and 32 years old, above average in intelligence, and the alumni of extremely strenuous physical training camps. Every wearer of a paratrooper’s wings has stepped out of an airplane in flight at least five times. When going into battle, these men literally march out the instant a red light flashes to notify them they are over the DZ. They descend beneath blossoming 24-foot silk canopies with knives, explosives, rifles, carbines, and new folding bazookas. Every man carries 75 or more pounds of gear down with him. More weapons, ammunition, and supplies descend alongside him in 300-pound bundles under separate, 18-foot rayon parachutes. Among these weapons are machine guns, antiaircraft guns, and both 60- and 81-mm. mortars. A 75-mm. howitzer and its ammunition are dropped in nine packages. Six of these are carried under the plane’s belly, held tightly in cup-shaped pararacks by steel bomb shackles. These may be released either by flicking electric switches inside the plane or by yanking hard on a manual control. The three other bundles are stacked in the plane and shoved out the door. An intricate system of linking the bundles together prevents them from landing more than 660 feet apart, even though each one rides under a separate parachute. Paratroop artillerymen jump from the same plane that drops these bundles and rip them open on the ground. From one bundle they take the howitzer’s rear trail, from another its front trail, from another the tube, and from another the wheels. They can assemble this fieldpiece in the dark with a minimum of tools. Hooking themselves to it by harness straps, like children playing horse, they can race it into position. One of the ammunition boxes, meanwhile, can be converted into a two-wheeled cart and used to haul fiber cases of shells up to the howitzer. With this weapon’s 14-pound projectiles, a good crew can split a hair at 7,000 yards or plug a hole at 9,000 yards. This howitzer is the heaviest of our paratroops’ regular equipment. Germans are reported, however, to have dropped a 2%-ton truck beneath a triple ‘chute. The best tricks of all are still up the American Airborne Command officers’ sleeves. Only two years ago, a glider capable of carrying nine fully equipped soldiers was “the largest yet built in this country” (P.S.M., Oct. ’42, p. 70). The smallest glider now in constant use, the CG-4A, carries 15 fully equipped men. The biggest glider now in production, the CG-13, carries 30 fully equipped men, or two jeeps, or a 1-1/2 ton truck. And there’s absolutely no reason why even greater gliders cannot be built, towed, and landed on battlefields. These infantrymen fly to battle in un-armored cabooses that look as fragile as orange crates and bounce and sway like the Toonerville Trolley. But these thin-skinned craft are stouter than they look. A tubular steel frame makes the cargo compartment so sturdy that, even though the wings and tail are smashed to smithereens when the glider lands, the men in its fuselage may hop out of the V-shaped emergency doors unscathed. After this war, you may see battered glider fuselages towed down the street as fondly as veterans of World War I have paraded French 40-and-8 box cars. An immense fleet of these dark-green, aerial freight cars can take off like a flock of birds. Loaded gliders are lined up on one arm of a Y-shaped runway. C-47 planes, looking no different from commercial airliners, taxi down the other arm to the intersection. Men run out and attach two gliders to each plane’s tail by long nylon ropes. The plane roars off, and the gliders leave the ground before it does. Meanwhile, another plane and another pair of gliders have started down the runway. With special instruments to show glider pilots their position in relation to the tow-plane at all times, these craft can be flown safely in fog and darkness. To reduce buffeting from the propellers’ backwash, the gliders usually are held above or below the plane. Even so, the “Hoimans” may have to tighten the straps that hold them on hard, plywood seats, to reduce the squeamish feeling in their innards. The Army is searching systematically for a sure means of preventing motion sickness, but none has been found yet. Glider pilots free their craft from the tow plane by shifting a knob known as “the eight ball.” From an altitude of two miles, a glider can coast 30 miles before landing. This 15-to-l descent ratio can be cut, however, to 4-to-l by using “spoilers” on the wings. A whole fleet of these craft can swoop into a field without making any more .noise than a gentle breeze passing a tree. The instant a CG-4A lands, a jeep inside it may start forward. A cable attached to the rear of the jeep raises the glider’s 400-pound nose. The cable then detaches itself from the jeep automatically, and the car and men in it dash off without pausing. A big CG-13 lands with its nose haughtily tilted in the air. But hydraulic apparatus inside the glider raises that nose majestically, plywood ramps are thrown out, and equipment rolls down them. The engineers have portable air compressors to run saws, drills, and other machines and inflate rubber boats. They have water-purification and construction tools as well as demolition devices. The doctors have a 25-bed hospital that is carried in 34 packs weighing from 35 to 85 pounds. It includes operating instruments, a stove, a sterilizer, and even a typewriter. An expensive chemical concentrate that can be substituted for blood plasma is used because it is easier to carry. Other specialists have comparable special equipment. Improvements are being made constantly. Colored parachutes enable our men to identify parachuted materiel quickly on the ground. The color scheme can be changed before each mission to fool the enemy. For some jobs, Americans also have camouflaged parachutes. Among the recent improvements in glider transportation are crash skids that protect the Plexiglas noses of the craft, tricycle landing gear with improved brakes, and separate rather than Y-shaped towlines to reduce sudden strains on an airplane hauling two gliders. Because of these astounding advances in the technique of using airborne forces and the great combat record of our paratroopers and parachutists, we now have a completely organized, separate Airborne Army under the command of Lt. Gen. Lewis H. Brereton. Composed of American, British, and Canadian personnel, the new unit approximates a full army in size and importanceâ€”possibly 250,000 men. Instead of being divided among various ground commands, the combat troops, planes, and gliders are under one commandâ€”a huge, unified airborne striking force. I can’t believe how naive this sounds. I like it that you take the effort of reading all this old articles as they are a source for perspective. Maybe they can help put our own dramatic claims in the right light. The important role of parachutes and parachuters in war times are not to be taken lightly but as this article from 1944 shaw us they are not be taken too seriously either. That “specially-designed flamethrower” was just the standard US M1-A1; the German Fallshurm had a disposable model that fired about 5 liters in one blast. The Italians had a similar type that held three gallons of fuel. Either of these would have been better for paratroops.